Am trying to confirm the year of manufacture for a Bimota YB8, Frame number YB800145. Was sold as a 1989 but everything I have read points to the YB8 not being made until 1990+. Are you able to confirm of point me to where I could find out. This is due to me racing in a pre 1989 class so I need to confirm. I need a belly pan for a 1997 YB11. the exup valve stuck closed and melted the original. gas guage sending unit for a Bimota BB1. Sources? I have the following list. If anyone needs!... Just let me know! i got a problem whit my bimota db2 sr, the centralina is burn, and i need a new one if someone can tell me were i can find a new, ihave 3 year's of no runs my Bimota, tank's. Could you please help me to find a workshop manual for a Bimota Hp 2. Am considering selling my virtually immacualte low mileage SB8R S.
Could you please help me with the contact details for Bimota Motorcycle importers in South Africa? Many thanks! need a homologation certificate or cert of conformity cne386 for a bimota db4. year of mfr 1999. I wanted to know who I can write to to obtain a picture of the bike broken down to just the steering set-up..I'm planning on building a bike but need to see the set-up of this bike..do you know the address to Bimota's head office or HQ? L to R: SB4, YB11, Tesi 1D. I'm almost certain a Ducati F1 clutch is the same. Try Frasers or Gowanlochs. Owner indicated that plates are not the same. I'm not convinced. I am looking to sell my 1997 DB2ef. It has 10,710 miles and I am looking for any offers. I saw some folks have the same problem I had so i thought I should help. My SB6 had a charging problem when I bought it, but after everything in the alternator was checked/changed the problem continued. I found that the problem was in the rubber coupling that is located between the alernator and the engine spline output. the way, but it is possible. The part is a replacement part from Suzuki and it has been changed in order to avoid the problem. Make sure you buy the 'new' one. I hope this helps a few people. I attach a pic with the SB7 costume I'm using for track days. Thank you and congratulations for your work in cybermotorcycle! No I have never been to Australia, although I would like to. It's quite a long trip from Europe! Here in Greece we play a trivia game with classic motorcycles and cybermotorcycle is a great pool of bikes, so we use it often. Our page on Classic Motorcycle Prices may help with evaluation. I'm looking for a Bimota SB2. I'm able to arrange shipping from most countries. I have a brand new Tesi 1D I would swap for a really good SB2 or alternatively I'm happy to pay cash. Any leads welcomed. I´m looking for buY One Bimota Sb 2. Wanted !!! Any information will be wellcome. Thanks ! i need a new thermostat and i was woundering what bike it's off or could you supply me one if so how much? Bimota SB6 '95. 19,000+ miles, lovingly looked after and taken care of. A lot of work has been done to the bike recently - new fork seals, new charging system/battery...etc. New Dunlop 209s with approx. 600 miles. Lots of info included - Bimota CD manuals and also one for 93-98 gsxr1100, magazines articles, brochure, model history booklet ... etc. Some spares as well. Everything NEW since I bought from Bimota dealer in early 90's. Will ship anywere in the world at cost. bike unused,only did about 50 miles in last 18 months.Bike now not charging,put in new spurious regulator,no good, put different alternator, no good, what else could it be? would be grateful for any help/suggestions. PS,sorry dont have pic as digi cam not working. Can you tell me how many SB6's were brought into Australia? I believe there were two importers - Gowanloch Engineering of Sydney, and later a Perth company (Thoroughbred Motorcycles?) which I think may be no longer in business. Moto One down in Melbourne may also have some information. Ed. Recently acquired 1992 Furano ex Japan. Only missing lower fairing and has Antera rear wheel. Rode it home and then petrol pump broke up, no identifying marks. What is it and where to get another ? Also would like workshop manual or at least wiring diagram. Perhaps I should have bought that fireblade after all ? The model just before Furano was called a Tuatara after the NZ native dinosaur still living. This is the only information I have found, so far. It's a PDF which mentions that filter - perhaps emailing the company may bring results. The seals on my front forks urgently require changing. Having removed them, we now find you need a special tool to remove the cartridge to get to the seals. Does anyone know of anyone in the Uk I can approach to buy or hire the kit, any help would be greatly appreciated. we phoned them tuesday visited and they replaced the seals in the forks no problem and brought them home. Very reasonable prices as well, which cannot be bad. Well worth a visit for any problems, with UK bikes they stock used and new Bimota motorcyle along with other Italian bikes. I have my bike 2002 6000 miles almost immaculate. I am an army doc stationed in Germany and I am thinking about picking up a Bimota SB8R and wondering how difficult it would be to bring into the US? I seem to remember a German firm converting new left over Biomotas to US specs in the late 90s. I have just bought this model and love it. However from 7,000 upwards the vibration is so bad as to make it impossible to ride. Suggest you take it to a competent mechanic, preferably one familiar with the GSXR11, as this sounds much more serious than the relatively high vibration levels associated with this engine in standard form. Ed. Cuando pongo el cambio en punto muerto, no se enciende la luz verde. ¿Es dificil reparar esta anomalia? When the gear is in neutral the green ligth don`t shine. The bulb is ok. Is dificult repair this? It is possible that the sensor in the gearbox is faulty, in which case the problem is easily fixed. If the problem is with the instrument cluster, however, you will need a specialist to inspect the console. The rear pads are almost certainly same pads as YB6 illustrated here. (SBS 519LF or equivalent). I've not yet tracked down the front pads. Ed. 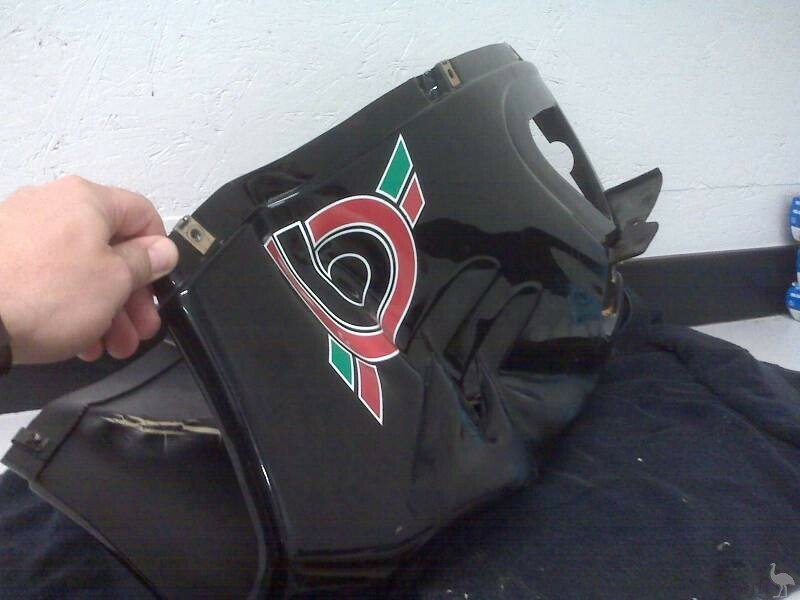 i need to get a windshield for my Bimota SB6R & a fiber cover for my battery storage. do you know where i can get these parts from? The BIMOTA is from 1996-97.have 14.000kilometers, YB9- Evolution. red, grenn, white- the colours.131 PS-?? Can you send me Informations-please ??? I purchased a new YB11 from new in 1998. During the guarantee period I had to have 2 new sets of clocks because when using the brakes the clocks stopped working. When the guarantee had expired I had the problem again, this time the dealer returned the clocks to Germany for repair. This time the German repairer stated that they had replaced a Zener Diode in the clocks which cured the problem. All has been OK until a couple of weeks ago when the fault reappeared. When putting on the front or back brake the brake lights do not work and the clocks drop to Zero. I would appreciate any information on this reoccurring fault and any ideas on how to fix it.